Yesterday the Case Foundation, Causes and Parade Publications kicked off the 2009 America’s Giving Challenge. It’s a 30-day nationwide online competition that encourages people to use their personal networks and social media to build cause communities that raise funds and recruit supporters for a nonprofit. 1. Champion a cause. Individuals who are passionate about a specific cause can become “cause champions” and will compete to obtain the most donations for their cause through the Causes application on Facebook. 2. Promote, donate or join a cause. All individuals are encouraged to take part in the Giving Challenge by joining, promoting and donating to the causes they care about. Facebook membership is not required to donate to a cause. Just go to Causes.com between now and Nov. 6 to win up to $50,000 for your favorite cause. Today, for example, causes receiving the most votes so far include the National Inclusion Project, Angel Covers, FACE AIDS, Compassion International and Facilitating Leadership in Youth. I just donated to Think Autism. 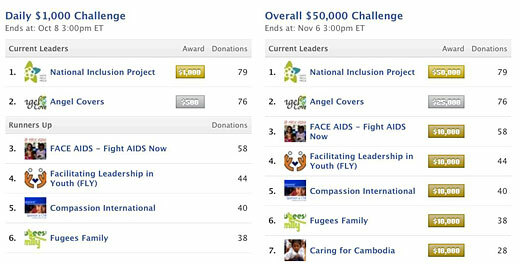 If you already support a cause on Facebook, opt in your existing cause.